Even among serious students of the paranormal there are selective doubts about what is credible. Some people believe in psi but not survival. Some accept the reality of telepathy but balk at the idea of precognition. Some might accept PK in the form of dice-throwing experiments but recoil before the prospect of more dramatic reports of macro-PK. Levitation is certainly a dramatic form of PK likely to hit the nerve of one’s boggle threshold. By chance, on a trip to Italy some years ago I acquired a 1722 biography of St. Joseph of Copertino. I had read accounts of St. Joseph’s levitations in a scholarly essay by Eric Dingwall and also in Herbert Thurston’s book, The Physical Phenomena of Mysticism. Eventually I began to read Domenico Bernini’s biography of Joseph, which Dingwall had cited as being rich in sworn eyewitness testimonies of the saint’s phenomena, which included more than levitation. I delved into the critical literature and assembled my own thoughts on the subject in a forthcoming book, The Strange Case of St. Joseph of Copertino: Ecstasy and the Mind-Body Problem (Oxford University Press). One might wonder: why bother with such a phenomenon, so extreme, so apparently rare, and so incredible on the face of it? In the first place, I believe the extreme – most intense and fully developed – expression of a phenomenon is likely to be the most interesting and revealing. If I want to understand the scope and nature of language I should use Shakespeare as an example. If I want to fathom the nature of evil I should study the Nazi inflicted Holocaust. The wheel will tell me something about technology but the Hubble telescope will take me much further. It turns out that levitation is not that rare. The annals of Christian mysticism alone contain about 150 different cases with decent testimony. Moreover, levitation is only one dramatic form of PK among many that are spontaneous (e.g., poltergeists) or experimental (e.g., placebo effects). And if we think of ordinary voluntary control of one’s own body as a form of “endosomatic” PK, levitation would be just a spectacular form of a common type of influence of mind on body. Levitation, because of its direct impact on one of the four forces of nature, seems to be telling us something about the potential outreach and power of the human mind. One thing can be said about the cases of levitation for which we have good evidence; they always evolve from an altered state of consciousness, in particular, ecstasy. Why this should be so is a challenge to science, a challenge to students of the mind-body problem. In the context of levitation, certain mental states seem to acquire vastly increased causal power. And we should add: cases of levitation are usually associated with mystical and sometimes with demonically possessed states of consciousness. J.B. Rhine once remarked that what people call ‘miracles’ are simply psi in action. So if we want to understand the empirical roots of some religious beliefs, levitation would be as good a place to begin as any. Levitation may be a sign of deeply latent and not understood powers of mind in nature, and not necessarily of God providing a charism or “gift” to the saint or mystic. The strange godlike power may reside in the depths of our subliminal minds. Perhaps flying dreams indicate a secret affinity between our subliminal minds and gravity-bending levitation. Flying dreams are usually quite exhilarating and provide a sense, a vivid taste of this latent inner capacity to transcend the gravity of physical existence. Something that can counter the force of gravity suggests a power – a level or extension of mind – whereby we are destined as a species to transcend the planet. Are flying dreams and the odd ecstatic levitation symptoms of our evolutionary future? But let us return to Earth. In my study of Joseph and his reported flights I was obliged to assess the value of the evidence. Let me summarize in brief what I came up with. The first thing to notice is that it’s easy to produce evidence for levitation – if and when it occurs. In contrast to assessing whether or not a claim for paranormal healing is true or a claim that so and so survived bodily death, making a claim for levitation is a simple matter: anybody with good eyesight can see whether an entire body is lifted off the ground or not. Of course, there are many cases where there may be confounding variables – inadequate lighting, reasons to suspect fraud, exaggeration, and so forth. Although Joseph began to have trance or ecstatic episodes when he was eight years old, it was not until he became a priest at 28 that he first levitated – while gazing at a portrait of the Madonna. He was alone when this happened. But thereafter he began to rise up in full public view, and in various circumstances. Most common at first were the levitations during Mass. In broad daylight, he would while saying Mass often float a few inches off the ground; but at special moments of the rite such as the consecration of the host the ecstasy would become more profound and he would rise into the air much higher and sometimes move back and forth or hover above the altar, his feet and robe lapped by long candle flames, without pain or catching fire. This sort of thing was plainly visible and began to occur regularly, and in fact for Joseph is was entirely involuntary and unwanted. Unwanted because it called invidious attention to him, and in the end caused him no end of trouble with the Inquisition. Joseph’s performances were never dubious sightings; they were show-stoppers, and his reputation as miracle mystic man spread all over Italy and then Europe. The records show at least 150 sworn depositions of witnesses of high credentials: cardinals, bishops, surgeons, craftsmen, princes and princesses who personally lived by his word, popes, inquisitors, and countless variety of ordinary citizens and pilgrims. There are letters, diaries and biographies written by his superiors while living with him. 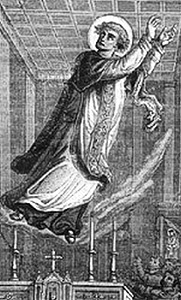 Arcangelo di Rosmi recorded 70 incidents of levitation; and then decided it was enough. Streams of inexplicable events surrounded the black-bearded friar. Driven by malicious curiosity, even Joseph’s inquisitors observed him in ecstatic levitation during Mass. Their objection to him was not the fact that he levitated; they were concerned with where the power was coming from, God or the Devil? It is impossible to suppose that all the stories about levitation were part of a Church plot to use miracles to control the mind of the masses. It wasn’t like that at all. The only way to make sense of the Church’s treatment of Joseph is to assume that he possessed these strange abilities in such abundance that there was talk of a new messiah arising. Joseph’s response to his Inquisitor’s was humble and honest. He had to explain that he enjoyed these “consolations” but that he was not proud or pleased with himself for having them. Nevertheless, the Church progressively tried to make him retreat to the most obscure corners of the Adriatic coast, ending finally under virtual house arrest in a small monastic community at Osimo. There was no decline effect in Joseph’s strange aerial behaviors; during his last six years in Osimo he was left alone to plunge into his interior life; the records are unanimous in saying that the ratti (raptures) were in abundance right up until his dying days. The cleric in charge of the community swore that he witnessed Joseph levitate to the ceiling of his cell thousands of times. The surgeon Pierpaolo was cauterizing Joseph’s leg shortly before his death when he realized the friar was insensible and floating in the air. He and his assistant both deposed that they bent down and looked beneath Joseph’s horizontal body, to be sure they weren’t dreaming. To repudiate the evidence for Joseph’s levitations would be to repudiate thirty-five years of history because the records of his life are quite detailed and entangled with other lives and documented historical events. We would have to assume colossal mendacity and unbelievable stupidity on the part of thousands of people, if we chose to reject this evidence. We would be forced to believe that when the duchess of Parma wrote in a letter that Joseph was the “prodigy of the century”, she was romancing or totally deluded. For me the interesting question is not the evidence for levitation (that I consider a slam-dunk); it’s what the evidence – and a whole family of interrelated forms of PK – means for understanding the human mind and personality. One is forced to reflect on what kind of a power is involved here. Jule Eisenbud once remarked that Joseph’s levitations strike at the heart of the human enigma in a way that Freud and Darwin do not. There is an unknown physics of levitation that could be the gateway into a new epoch of human evolution. Why levitation? Well, surely it is a powerful item that would have to figure into what J.B. Rhine called “the parapsychology of religion”. Parapsychology is an instrument for mediating between science and religion in a possibly very useful way. Much of the so-called debate between science and religion has revolved around discrepancies between Bible-based cosmology and modern scientific cosmology. Is the Earth the center of the Universe or a Speck in Infinifty? Are we God’s darling creation or super-smart monkeys? Question like these don’t touch on the reality of inner life, the values and practices and beliefs associated with different ‘religious’ traditions. They are questions that deal with religion in a remote and abstract way. There are more basic questions that deal with the range of subjective human experience covered by the world of religion. Questions like, Is there a greater mind or spirit at large in the world? And if yes, can we interact with that greater mind? When I am sick or in danger or in need of guidance, am I all alone in a nonresponsive universe? Or are there some secret avenues of communication open to me in my hour of need or perplexity? Is death the end of my adventure on earth or does the story get picked up again on a different channel at a different wavelength? Are all my thoughts impotent echoes that sink into oblivion or are they as William Blake said “filling immensity”? Is all the mystery, every marvel and miracle in the history of the world part of a gigantic illusion? Questions like these touch more closely on what most people think and feel when they ruminate on these questions that center around religion. And questions like these are at least open to conversation in light of what we know about consciousness, psi, and even quantum mechanics. In my opinion, with the full panoply of extraordinary phenomena garnered from parapsychology and consciousness studies, it is possible to start a completely different kind of conversation about religion, spirituality, and the natural sciences. A conversation of the sort I have in mind will not take place on a sufficiently large scale that is needed until two things happen: concessions, one from science and one from religion. Science needs to give up its blinkered attachment to an old-fashioned and stultifying reductive materialism. Religion has to renounce with a loving smile its pretensions to immutable and absolute truth; above all, it must lay aside its violent contention that one or another dogma must rule on pain of death. To summarize this brief statement and answer the question: why levitation? First of all, however outrageous the notion, there is solid evidence for it, and the evidence should be confronted. Second, levitation is a rare and spectacular demonstration of a latent power that manifests in many different forms. What we call ‘psychokinesis’ — in its full potential – needs to be included in any complete account of the human personality. A third reason we should attend to the phenomenon of levitation is that it provides excellent fodder for discussion in the parapsychology of religion. Infinitely interesting and unbeknownst to me. Thanks! This entry was posted on October 8, 2013 by rhinemageditor in ESP, levitation, Parapsychology, Psi, Psychic, religion, science and tagged evolution of consciousness, intuition, levitation, parapsychology, psi, psychic ability.